Zach Galifianaki has won four gongs at the 15th annual Webby Awards. 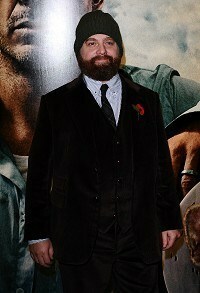 His online series Between Two Ferns With Zach Galifianakis won him best web personality/host, best comedy short and best online variety show. He won the latter in both the voter-chosen People's Voice category, and the proper Webby Award category. The Hangover star's irreverent, sporadically released show, which appears on FunnyOrDie.com, is done in the style of a cable access show. Zach, who was honoured last year by the Webbys as best actor, belligerently and absurdly interviews celebrity guests. Friends star Lisa Kudrow won two awards for her Web Therapy series. Arcade Fire's innovative The Wilderness Downtown music video also won two awards, as did the interactive Johnny Cash Project. Both web-based music videos were directed by Chris Milk. Justin Bieber took the People's Voice award for best comedy video for his April Fool's takeover of FunnyOrDie.com as Bieber or Die. The site's home page was remade with clips featuring the Baby singer in famous viral videos. The comedy site, co-founded by Will Ferrell and Adam McKay, could boast a total of nine awards. That included the Webby for best humour site and a People's Voice award for Jim Carrey's performance as Ronald Reagan in the site's star-packed Presidential Reunion video.